A cracked tooth can be caused by any number of things, but it usually has the same result: painful sensitivity and a potential to worsen. Unlike missing teeth or periodontal disease, cracked teeth aren’t always easy to see. Our Cracked Tooth Toothflix® 2.0 streaming video is a great resource to help explain the signs and causes of cracked teeth while listing possible treatments. Teeth aren’t indestructible – no matter how well you take care of them. This video explains that it is possible to cause damage when biting on something hard or putting too much pressure on teeth. Although there are steps patients can take to strengthen their enamel, it’s important they know what to do in the event of a cracked tooth. This video will help them understand why their tooth cracked and how you will fix it. Each Toothflix video you purchase is instantly accessible through your online ADA e-bookshelf. To learn more about the Toothflix video series, visit ADA.org/toothflix. 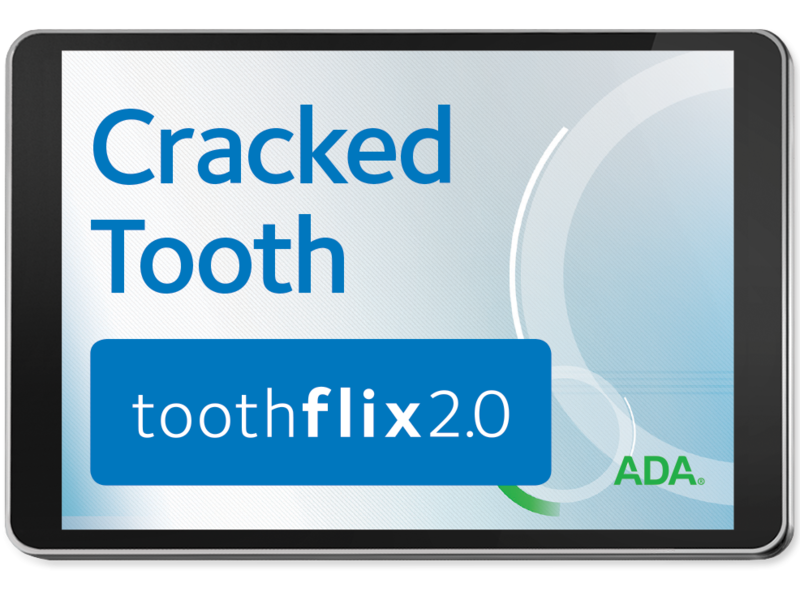 Purchase your Cracked Tooth – Toothflix® 2.0 Streaming Video today for instant access to this helpful resource on a common issue.